We love happily-ever-after (HEA) or happy-for-now (HFN) books! Need that happy at the ending, yes? This world we live in is hard enough as it is. Reading is an escape from that. IT NEEDS HAPPY at the end! That's why we're excited to let you know that Carina Press has a Romance Promise! ALL of their books have those HEA or HFN endings! No matter how much angst and cray cray things get in one of their books, you can be assured they will end HAPPY! Questions about their Romance Promise? The NOT SO FINE print is here. How do YOU feel about those HEA and HFN endings? 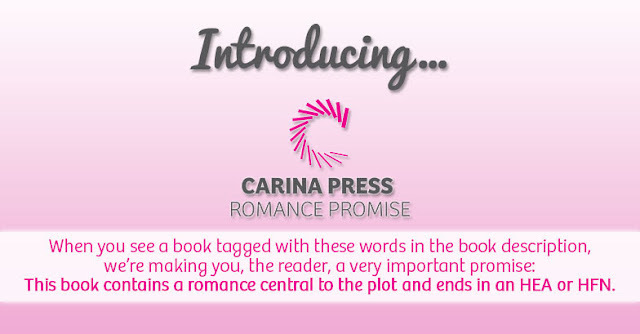 To celebrate this announcement, Carina Press is sponsoring a GIVEAWAY. You know we love the GIVEAWAYS here at Stuck In Books! Contest runs from July 6, 2016 - July 19, 2016. Open to residents of U.S. and Canada (excluding Quebec) only who are 18 years of age or older. eBooks will be mailed to the winner by Harlequin. This giveaway is hosted and sponsored by Carina Press. StuckInBooks is not responsible for selecting a winner or sending out prizes. I like happy ever after best. It just makes everything better when you have a HEA. I turn to books with happily ever after endings because real life isn't always so happy. They let me escape, which is why I read anyway! I prefer HEA endings because I enjoy the break from the reality of HFN situations. It allows me to believe that the HEA is possible. HEA are my favorite because you invest in the couple and want them to last! HEA because I'm a true romantic at heart and books are my escape from reality so I don't want to be crying or end up sad at the end. I love books with HEA's because they make me fe happy when I finish reading them. HEA and HFN make me feel good. They are a nice change from reality. Thanks so much for the giveaway! I love HEAs because you get closure and they make me feel all warm and fuzzy inside. If only real life worked that way, ha.